Let a special someone know how much you appreciate they care they give to your precious children! 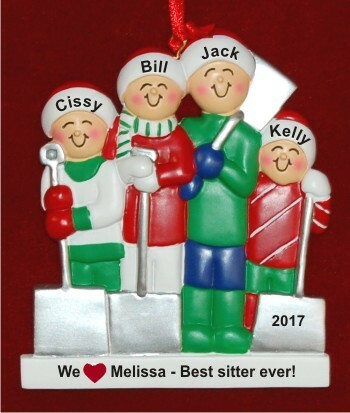 The 4 kids white Xmas baby sitter ornament personalized just for the occasion will be a favorite now and lasting memento. This resin personalized Christmas ornament includes the details you provide, but they’re painted by hand in a stylish font to create a personalized baby sitter ornament 4 kids that is one of a kind. Any of our 4 kids personalized ornaments work well for baby sitters, so browse them all to find your favorites. The baby sitter 4 kids personalized Christmas ornament includes a display cord and our velvet gift pouch.